Click to send an email to the government and protect public health care in Ontario. 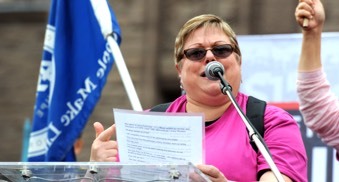 The deadline for the OFL Solidarity and Pride Award nominations is April 23, 2019. The OFL encourages solidarity across the labour movement. Register your labour actions here so other unions and locals can stay well informed. We are stronger together. Workers won significant changes to the Labour Relations Act and the Employment Standards Act. We must now make sure workers know their rights under the Fair Workplaces, Better Jobs Act. The labour movement is working to ensure that workers know their new rights. Read the booklet on what we’ve won and what workers are still fighting for. 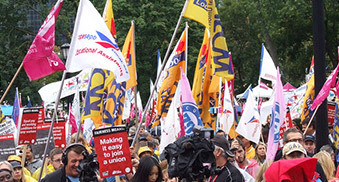 Sign up to receive updates from the OFL about campaigns and actions. Talk to your friends, family, and colleagues about the rights we’ve won and what we’re still working for. Follow @OFLabour on twitter to stay up to date on the campaign. Download a booklet on changes to the Employment Standards Act and the Labour Relations Act called Know Your New Rights! View More about Know Your New Rights! Workers who are dealing with domestic violence need support in the workplace in order to escape an abusive situation. This campaign aims to give labour organizations the tools they need to bargain to ensure supports for survivors. The OFL has advocated for domestic violence leave to be included in employment laws through Bill 148. 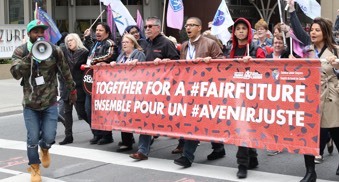 At the same time, it has developed a bargaining guide to support labour organizations as they work to guarantee this leave in collective agreements. Download the Domestic Violence Goes To Work Every Day: A Bargaining Guide. If you have questions, please contact the OFL at info@ofl.ca. Workplace deaths are too often the result of poor health and safety practices in the workplace. Employers who don’t provide proper safety standards to their workers should face criminal charges. All workers must have safe and healthy workplaces. When a worker is killed, the OFL contacts police to remind them of their duty to conduct a criminal investigation through a C-45 lens. When you see or hear of a workplace death, contact the Ontario Federation of Labour at info@ofl.ca, so that the OFL can follow up with police in the area.